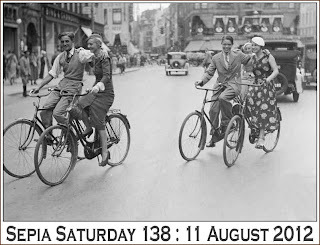 Sepia Saturday 136 (post your posts on or around Saturday 28th July 2012) will coincide with the first full day of the 2012 London Olympics.We are all about to be buried under an avalanche of sport; drowned in a tsunami of bulging muscles, pounding trainers and in-flight javelins. 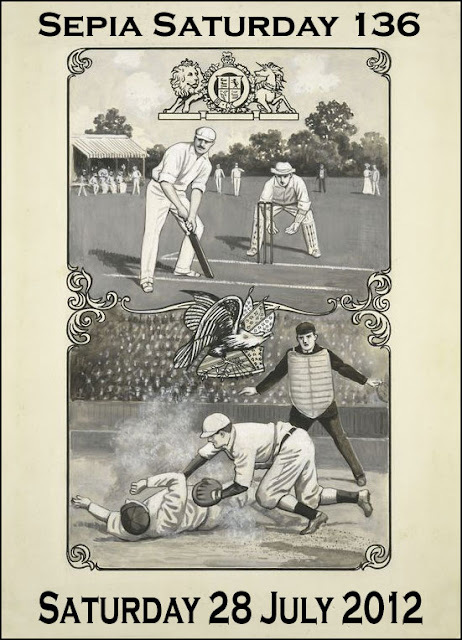 Two sports you won't see featured at the Olympic Games are those trans-Atlantic rivals, cricket and baseball. Here on Sepia Saturday we don't want them to feel left out and therefore we will spotlight them here. The illustration comes from the A G Spalding Baseball Collection which forms part of the Flickr Commons collection of the New York Public Library. So off you go : sport, bats and balls, trans-Atlantic rivalry : you can throw the theme wherever you want to and, as always, you can hit it right out of the stadium if you want to. Post your post, link your link, and don't forget : try to take a trip around the rest of the bases. 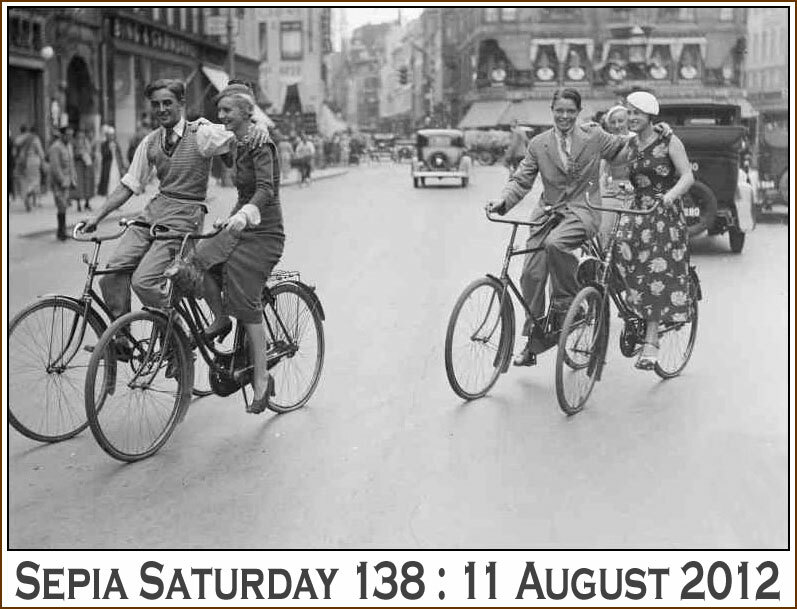 Looking forward, things continue to be seasonally sporting here on Sepia Saturday for the next couple of weeks. Here's a quick preview. 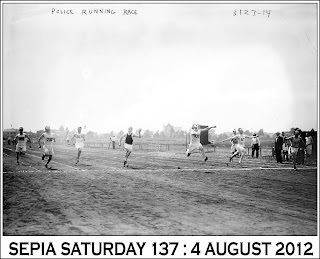 So get ready for the greatest festival of old sporting photographs ever seen on Sepia Saturday. You have just seen the opening ceremony - let the games begin. I have an Olympic photo to post on Saturday! Enjoying a swim in the 1930's. How about the first harvest festival this week? I would love some more info about Lammas. My great-uncle had a short run in pro baseball (minor league though). I'll get there in the end - my first link was wrong, so hope this works OK. I'm exhausted already. Not only with reading about all the sports mentioned in the comments but from my own bit of digging as well. And I have dug up a potato. 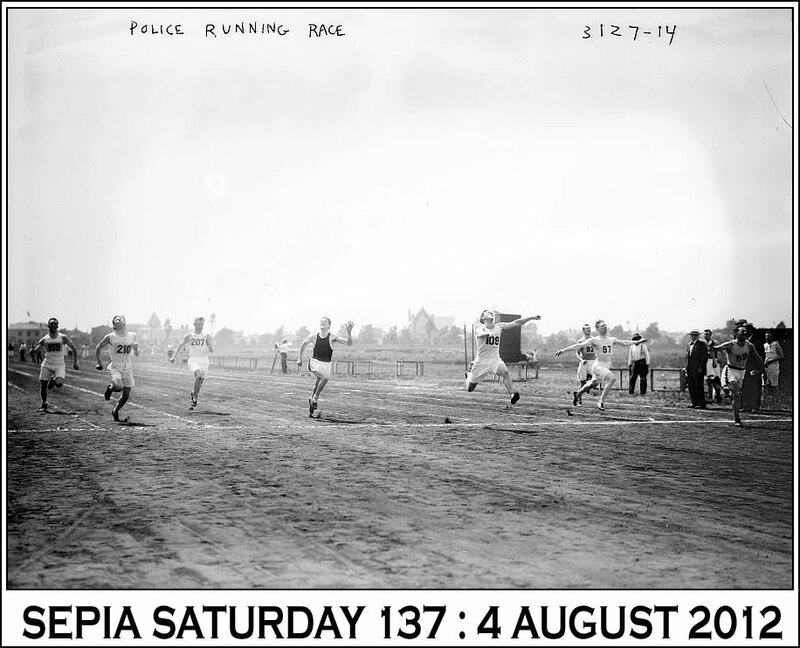 I've found three nice sporting photos in the flea markets recently. See my post. I'm off now to watch the Olympic bicycle racing in real life, which conveniently passes my parents' house this weekend. A Little Out Of Breathe..but here I am! I've got old fashioned swim suits and also pose the question as to the origin of American baseball. Made it just in time to watch the opening ceremony. Have fun checking out 100 year old sox everyone! I have posted bikes and more bikes! Hope you enjoy. This weeks prompt is a first for me. Not many athletes in my family, but found some games that won't be included in the Olympics. Fun prompt. My post from Netherlands is about marching. I forgot to link my post to SS last night, so taken I was by the opening ceremonies, and this morning, even before my first coffee, I've finally linked on the Fairy post, and then, here. Alan, can you remove entry #34 on the Fairy linky hing-y? Thanx!! And by the way, if some of you in the UK grind their teeth at the cost of the London's Games, if it helps, a big thank you from my part, as I think it was off to a great start. Remember, it took us Montrealers 30 years to pay the bill in full, plus interests, of course!! Now, I'll get my coffee. Yet another for cricket here! I couldn't stay away ... my Sepia pics are of my Dad's side of the family, but my baseball stuff is a link to my first Major League Baseball game last summer. Greetings, and how is it in your world today? Sporting I just know! :) I am enjoying many bloggers photos from all the festive happenings in England as present. BUT! My Sepia moments today wanted to go to another dreamy location for me! I hope you enjoy my post! Just checking in. :::Waving::: miss doing a theme, but havent had time still, but have plenty of family research pics that I have done. I've got nothing musical on cricket pitches or baseball diamonds, but I do have something entertaining. I'm a day late and a dollar short, but I'm here! Never too late! Thank you so much for hosting this...it's a wonderful idea! Better late than never, I guess. A photo of my father apparently about to be hit with a baseball bat.